1. Compact structure design that combines DTH drilling rig and middle pressure screw air compressor. 2. A single stage middle pressure screw air compressor with a compacity of 10m3/min and pressure of 1.5Mpa for pneumatic impact, high efficiency and low energy consumption. 3. A low gravity and balanced distribution of the car with a heavy four wheels and one track configuration (driving wheel, guide wheel, thrust wheel, riding wheel and one track ), a 19 degree automatic leveling device and independently controlled double locking system for stability in different working conditions. 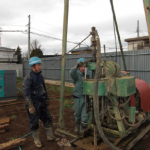 The drill rig is also equipped with a two speed travel motor and reducer structure for the perfect combination of speed and strength. 4. Large displacement hydraulic pump mounted directly on the back of the engine and simple structure to reduce errors. 5. Large scale drilling boom lifting system meets the needs of a variety of conditions and different stages, especially deep holes. 6. Highly integrated hydraulic control system and centralized layout platform which controls the whole machine. 7. A switch valve for the rotary and propeller speed can adjust according to the different features and conditions of the rocks for a fast drilling speed. 8. A real time monitoring system and stable self-protection system accurately reflects and controls the working status of the drilling rig. It will automatically shut down when the working status goes outside the set range or there is any error in the machine. 9. Effective two stage dry dust collection system, keeping the working environment cleaner and energy saving.